Apologies for being slightly behind on the Ethical Arboriculture blog post front. The original plan was one a fortnight, but thats gone a little bit askew, with tree surveys for proposed developments, tree surveys for subsidence claims and a few other things that are being saved for later, getting in the way. Anyway, this post is all about the things you can see if only you look. I’ve lived where I am now for the past four years, I know it’s four years because Facebook brings up a certain memory post that reminds me. For a large part of those four years I’ve walked the mad terrier dog past several cherry trees with huge cavities in the trunks. These trees are managed on behalf of the city council by a certain management company who don’t seem to be quite as ruthless with the tree stock here as they are in another city but thats a story for another day. Every year these trees, despite the obvious damage and decay, have full vigorous crowns and huge amounts of pink and white blossom. Bees are in abundance and, much to the disgust of the mad dog, recently several squirrels have taken up residence . All this looks fantastic and adds some much needed greenery to an urban area, even if they are lacking on a bit of variety. But hiding away in the trunk of at least one of these trees, is a pale yellow fruiting fungus body, a funky looking mushroom feeding on the dead and decaying wood. Stands out clearly inside this cavity, a pale yellow contrast against the brown decaying timber thats its consuming. It’s an edible fungus that supposedly tastes like chicken, although I’ll freely admit I can’t vouch for this. 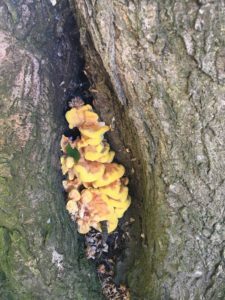 The fungus isn’t damaging the tree, the damage looks well compartmentalized, just recycling the dead bits and turning them into an edible resource. I spend hours walking round in circles looking at trees, sometimes it looks like I’m hugging them when I’m trying to catch hold of the girth tape, looking for defects, fungal fruiting bodies and all manner of other thing’s, but in all the years I’ve walked past this particular tree I’ve never spotted this staring straight at me. Just goes to show that things are there if you look for them, and sometimes you really can’t see the wood for the trees. ← Two fella’ s came all the way from Canada to talk about trees.